Listening to her eloquent and charming acceptance speech for Best Supporting Actress in a Film at Saturday's SAG Awards, I couldn't help but to fall in love with the rising star that is Lupita Nyong'o. The breakout star of the critically-acclaimed 12 Years a Slave has wowed us all with her on-screen performance; her flawless fashion choices have landed her on countless best-dressed lists; her stunning beauty has landed her a Miu Miu campaign. She's also a Yale graduate and speaks with the utmost articulacy. 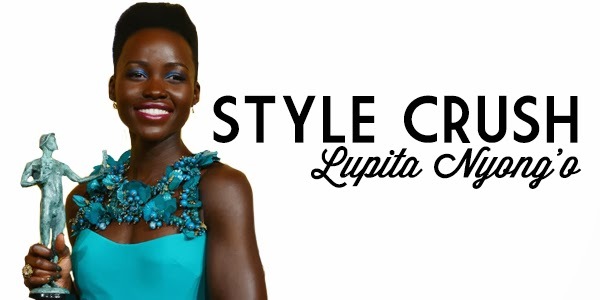 Basically, if you aren't a fan of Lupita by now, you should be. With a well-deserved SAG win under her belt now, Nyong'o has the Academy Awards to look forward to, where she's been nominated for Best Supporting Actress. I am already excited to see what fabulous dress she will wear to Hollywood's biggest night. In February, Nyong'o will star in Non-Stop alongside Liam Neeson and Julianne Moore, and I know we will be seeing her in many more films to come. This girl has true star power. Nyong'o's style is simple and streamlined - she prefers bold, attention-grabbing colors over busy prints or embellishments, and you can always count on her to arrive in a unique silhouette; she rocks a cut-out dress like no other. A personal favorite of mine (and every best-dressed list, for that matter) is the Ralph Lauren cape dress she wore to the Golden Globes. She looked like a regal queen, and let the vibrant red of her dress - along with matching lipstick - do the talking. The look was so stunning that Amy Adams had to forgo the red cape that she had originally planned on wearing over her dress. Talk about rocking the red carpet!